A dorsal view of a new species of club-tailed scorpion. Rhopalurus ochoai is described from Venezuela. This pale yellow or tan scorpion is named for Peruvian arachnologist Jose Antonio Ochoa Camara, a prolific scorpion biologist who collected most of the type material of this new species. Rhopalurus ochoai is medium-sized (about two inches long) and appears to be restricted to the dry forests of Venezuela. Credit: © The American Museum of Natural History, Universidade de São Paulo, and California Academy of Sciences. A team of researchers—including Dr. Lauren Esposito, Curator of Arachnology at the California Academy of Sciences and colleagues the American Museum of Natural History and Universidade de São Paulo (Brazil)—have painstakingly revised a large group of Neotropical "club-tailed" scorpions. 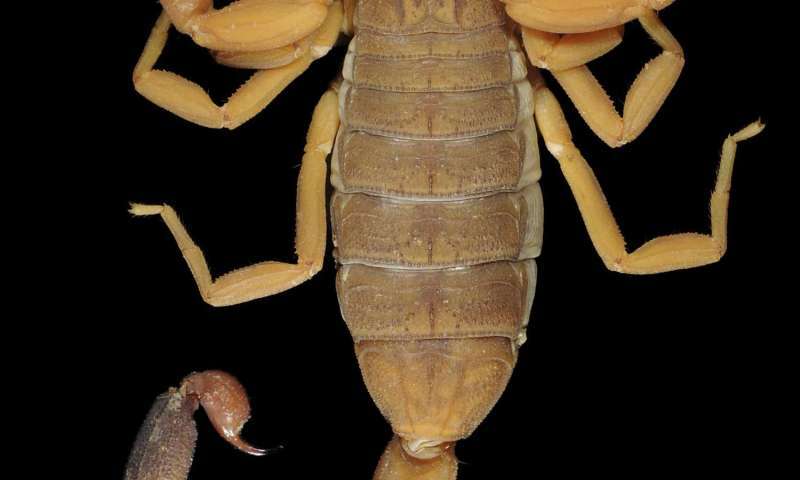 After sifting through DNA and comparing the physical traits of hundreds of specimens to reorganize (and strengthen) scientific understanding of this scorpion group, the scientists described three two new genera and new species. The authors also restored a long-forgotten group called Heteroctenus. The colorful, new-to-science club-tailed scorpions hail from the tropical regions of North, Central, and South America. The results appear this summer in the Bulletin of the American Museum of Natural History. "Clocking in at 435 million years old, scorpions are among the oldest living terrestrial arthropods on the planet," says Esposito, one of the world's only female scorpion biologists and expert in the evolution of their venoms. "We need to understand what they are and where they live so we can protect them. This review clears up longstanding confusion about the club-tailed group, but there's still so much to discover." Scorpions—which give birth to live young—are found in every ecosystem on the planet, from cave systems below sea level to the snow-capped peaks of the Alps. Arachnologists estimate that the 2,200 species of known scorpion species only encompass around 60% of the group's total diversity. Esposito is part of a dedicated group of arachnologists determined to fill in those taxonomic gaps and care for vitally important museum collections—often referred to as "libraries of life" available to students and researchers around the world. Though their characteristics vary, specimens of the three new species—Ischnotelson peruassu and Physoctonus striatus from Brazil, and Rhopalurus ochoai from Venezuela—inhabit the same overarching group of mostly large-bodied, strikingly colored, and sonically gifted scorpions. 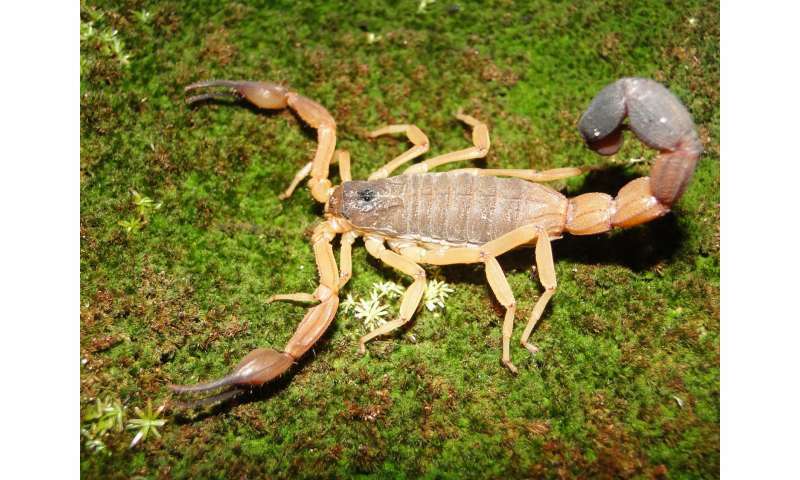 "Savannas, caves, deserts, open fields, and forests—you name the Neotropical landscape," says Esposito, "and we can show you a club-tailed scorpion that lives there. One wild thing about this group is that many species have the unique ability to make sounds by rubbing a specialized comb-like structure against their sandpaper-like abdomen. We think it's probably a loud way to tell predators: 'back off.'" Esposito says the warning is audible to the human ear, adding that it "sounds like hiss, or even like a maraca shaking." Most specimens collected explicitly for this study—about 200, in addition to specimens from museum collections—were detected at night using UV lights that produce a blue-green glow on scorpions' armor. Many of the study's authors turned over rocks, searched caves, and explored near rivers and forests to look for male and female representatives of the club-tailed group. Portable GPS devices record the geographical coordinates of each discovery so scientists can trace specimens back to their home environment. "This project exemplifies the many uses of natural history collections, without which research of this kind would be impossible," says Dr. Lorenzo Prendini, Curator of Arachnida at the American Museum of Natural History (AMNH) and coauthor of the study. "Making use of the vast scorpion collections at the AMNH, among the world's largest, we were able to combine 'traditional' comparative morphological and anatomical data, reflecting the physical attributes of these scorpions, with DNA sequences from their nuclear and mitochondrial genomes. Integrating these diverse sources of data enabled us to achieve a more holistic understanding of the evolution and classification of these amazing scorpions." "It's mind-blowing how new genomic technology allows us to reevaluate entire plant and animal groups," says Esposito. "We can take new and old scorpion specimens, zoom in on their DNA and other characteristics, and use that information to better understand where they belong in the evolutionary tree. This would have been unthinkable decades ago." Lead author Esposito is on a mission to train the next generation of scientists and nature advocates. In 2014, she co-founded Islands & Seas, a science and education nonprofit currently building an independent network of field stations where scientists, tourists, and locals can work together to conserve natural resources. Its first field station is in San Juanico, a small fishing village in Baja California Sur situated just south of El Vizcaíno Biosphere Reserve, the largest wildlife refuge in Latin America. While ecotourism businesses built around whale-watching surround the area, the local community is only just on the verge of development; with their work, Islands & Seas hopes to influence development in a sustainable direction. "First, the locals need to know what they have," says Esposito. "And before they can know what they have, we need scientists and students to conduct biodiversity surveys because nobody knows what's there." The organization recently completed its first "Science & Surf" summer institute in field biology for undergraduate students, with scientists from the Academy and other partner institutions showing them the ropes. "With the help of the students and local community, we've started building baseline information of what's there in the biosphere reserve," says Esposito. "And then we'll continue to build from there." Biology enthusiasts (and scorpion fans) stay tuned for open spots in 2018. This new genus is named for the Tupi word "Jaguajira"—meaning scorpion or "one who devours." The scientists say these "large, robust" scorpions reach up to more than four inches long and range in color from deep browns and black to yellow and slightly orange. The three known species of this group have been found under stones in daylight and with UV light detection at night. Named for Greek words referring to a remarkably slender part of this scorpion group's abdomen, this small new genus (two known species) is endemic to northeastern Brazil. They are colorful; orange, many shades of yellow, reddish-brown, with black details. At just under two inches long, the Ischnotelson scorpions are generally smaller than members of the new Jaguajir genus. Collected from beneath stones by day and under UV light detection by night, this new species ranges from dark yellow to light brown. They are small—only about one inch long—and prefer very dry environments with sandy soil.